NEIL McManus will miss Saturday’s all-Ulster Christy Ring Cup Round 2A clash in Cushendall as the fixture clashes with his wedding day. While most of his teammates will spend the week recovering from last weekend’s gruelling extra-time epic against Carlow, McManus revealed he will be trying to avoid the traditional pre-wedding ‘doing’ over the coming days. McManus will wed his fiancée Aileen Martin, captain of the Antrim camogie team, on Saturday as his teammates attempt to overcome Down and book their place in the semi-final. “I am set for the high jump, I am just trying to avoid the back of a trailer here at the minute,” said McManus. “It will be a game of cat and mouse for the next few days.” “I haven’t had much to do with planning the wedding to be honest. Anything I have been asked to do, Aileen checks it anyway to make sure it is done right. “I just have to turn up looking half presentable. McManus isn’t the only experienced member of the squad set to miss Saturday’s game with Dunloy’s Paul Shiels set for another spell on the sidelines. After landing a stunning point from under the main stand at Netwatch Cullen Park to bring Antrim to within a point, Shiels was forced off the pitch moments after McManus levelled the game in injury-time. It was since emerged that Shiels has sustained a hamstring injury and won’t return until the latter stages of the competition. Matthew Donnelly, meanwhile, has been ruled out for the remainder of the inter-county season after it was confirmed that he sustained knee ligament damage. Rossa’s Deaglan Murphy will also miss Saturday’s game as he continues to recover from the ankle ligament injury he picked up in the closing stages of the Ulster final win over Armagh. With so many players unavailable, the strength-in-depth of the Antrim panel is set to be tested against the Ardsmen this weekend, but McManus has every faith in his teammate to do the business. “We have been preaching all year about the strength of the panel,” said McManus. Antrim’s character was certainly tested in their Christy Ring Cup opener last weekend. Antrim battled back from four points down both late in normal time and at the end of extra-time to grind out an unlikely one-point win. McManus says the nature of the victory made it a very satisfying day at the office. “It was one of those days when we were just a bit sluggish. I think we have played for the last eight or nine weeks in a row,” added the Cushendall ace. “Having to get up for a game every week is mentality tough. “We found it hard to get off the mark. We struggle to get going and we probably weren’t firing on all cylinders at any stage of the game to be honest. “That’s probably one of the most pleasing aspects of the whole day – we just kept going and we wouldn’t take no for an answer. “It would have been easier to say ‘it is not our day’ and move on. “We hung in there and we got over the line at the end. “That made it one of the most memorable days for Antrim.” The fact that the two sides clashed in the Division 2A National Hurling League final and that they played out a thrilling opening tie has led many to speculate that they could clash again in the decider and McManus said he would relish another battle with the Barrowsiders. “There is nothing between Antrim and Carlow,” said McManus. “As long as I have been playing for Antrim, there’s nothing between the sides. 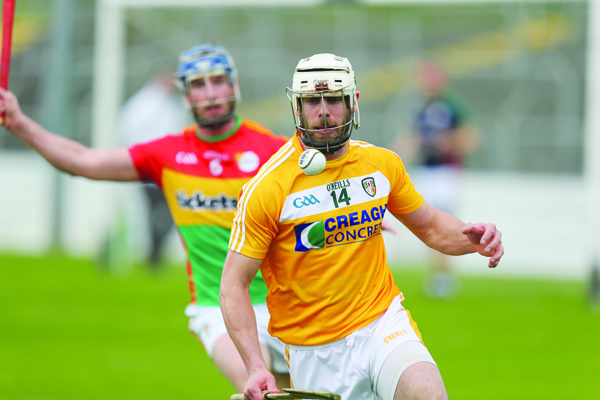 “Antrim and Carlow’s progression and regression seems to have mirrored each other over the years. “They have been at a similar standard over the last dozen years or so. The absence of McManus and Shiels creates two vacancies in Antrim’s starting 15. Paddy McGill is likely to continue at centre back while Conor McCann could switch to midfield in place of Shiels. Niall McKenna, Maol Connolly and Eoghan Campbell will probably line out along the half-forward line while James McNaughton may make his first Championship start after scoring the winner last weekend.